Hyperscale data centre spending is driving disk storage system spending higher, but mainstream vendors aren’t benefiting as the hyperscalers are buying direct. It's a big change in buyer behaviour. Storage systems revenue Q4’13 to Q4'14 (EMC 3.3 per cent, HP 4.8 per cent, Dell 5.2 per cent, IBM -23.8 per cent, NetApp -3.5 per cent, ODM direct 39.4 per cent, Others 20.2%). ODMs are Original Design Manufacturers, such as Quanta and SuperMicro. The market as a whole grew 7.2 per cent from 2013’s fourth quarter to 2014’s fourth quarter. EMC, HP and Dell each grew revenues but at less than the market rate, with Dell growing the most. IBM revenues plunged -23.8 per cent while NetApp’s shrank -3.5 per cent. Surprisingly the others category grew strongly at 20.2 per cent, illustrating again a shift away from the main vendors as, El Reg suspects, buyers went for cheaper capacity. Q4, 2014 % revenue market share; EMC 22.2 per cent, HP, 13.8 per cent, Dell, 9.0 per cent, IBM 9.0 per cent, NetApp 7.2 per cent, ODM direct 12.8 per cent, Others 25.9 per cent. An interesting question is to ponder where these trends are taking us, especially with Seagate and WD/HGST moving up the value stack and shipping direct to hyperscale buyers. Mainstream disk storage system vendors are going to have to run faster to stay still, so to speak. 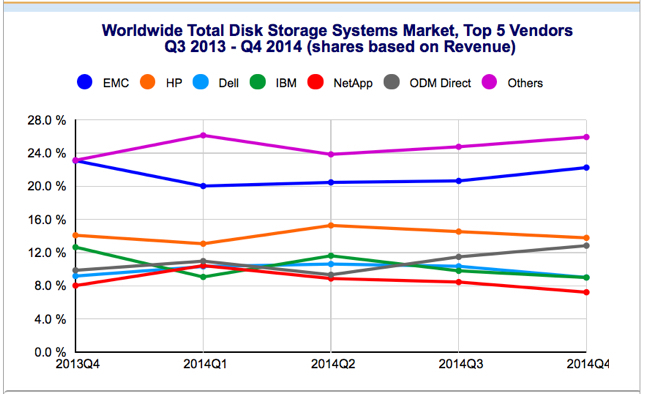 IDC separates out external disk storage systems and here is the chart showing the quarterly trends there. 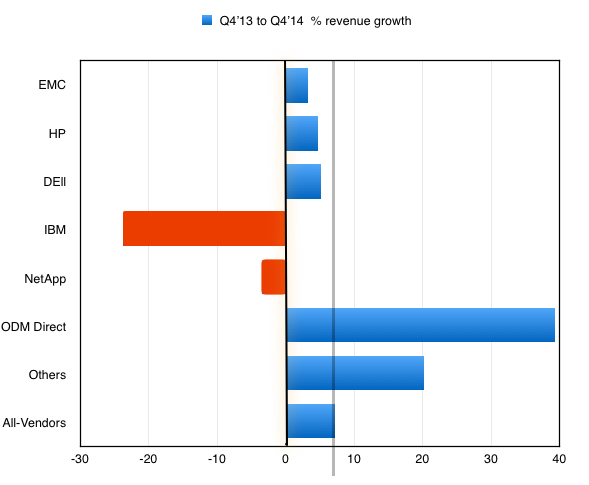 Q4 FY 2014 percentages: EMC 32.9 per cent, IBM 11.7 per cent, NetApp 10.7 per cent, HP 9.6 per cent, Hitachi 8.1 per cent, Others including Dell 27.0 per cent. Here NetApp has fallen below a recently rising IBM. 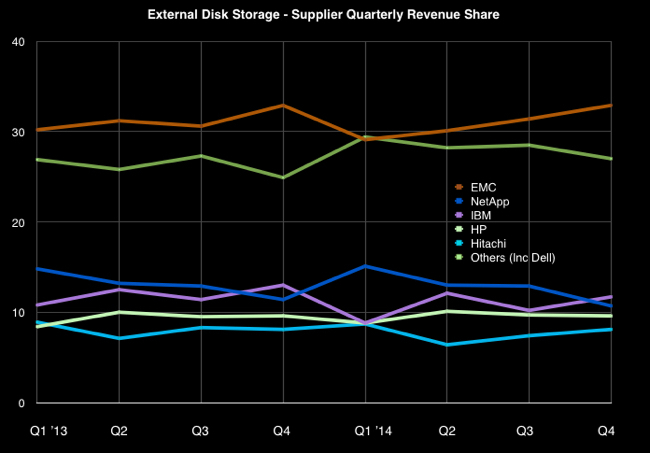 Both EMC and Hitachi are on a growth trend while the Others category, which includes Dell, is turning down. In fact IBM’s situation here looks reasonable compared to NetApp. On current trends NetApp's share could dip below HP’s next quarter, with Hitachi’s share rising to meet it.